Description: Mastersmith PJ Tomes is well known for his exceptional designs -- among which are his hunting/utility knives. 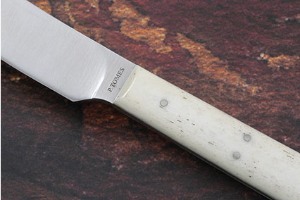 He had so many requests, that he had this tremendous utility knife handmade to his specifications. The results are exceptional. The classic drop point blade has been a long time favorite among hunters and outdoorsmen. The ball bearing high carbon stainless steel used for the blade ensures an exceptional, long lasting edge. 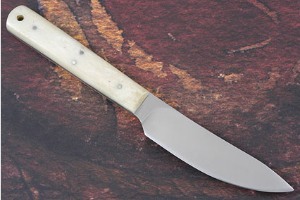 The handle is formed from stabilized bone and sits on a full tang for strength and durability. It will easily hold up to the heavy rigors of hard use out in the field. 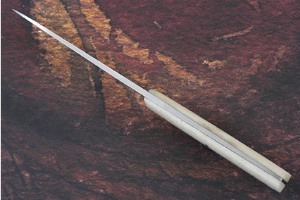 A hole set in the end of the handle allows the easy addition of a lanyard. Both the blade and tang are distal tapered, ensuring a perfect balance. 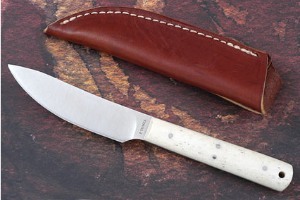 This knife is accompanied by a pouch style leather sheath.